Gorgeous Pants! 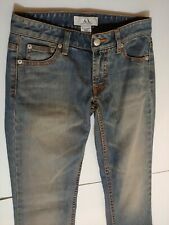 Fading Through Thighs, Light Wash.
A|X ARMANI EXCHANGE Women's Denim Jeans Size 0 . Condition is Pre-owned. Shipped with USPS Priority Mail. 7.25: Rise. 14: Waist (front side to front side). Waist: 27in Inseam: 28.5in All of my items are in excellent condition unless otherwise noted. Micro Flare Jeans ~~. 1% Spandex. Cotton Blend: 99% Cotton /. Machine Wash. Size 0 Regular. Rear Patch Pockets. Slight Fading Down Thighs. Photo's 3, 4 & 5 are of the Actual Pants. Waist: 30in Inseam: 31in All of my items are in excellent condition unless otherwise noted. Waist: 28in Inseam: 28in All of my items are in excellent condition unless otherwise noted. Waist: 28in Inseam: 31in All of my items are in excellent condition unless otherwise noted. NWT! "SO" LADIES SKINNY DENIM JEANS SIZE 0 $36. They are a size 0 and average length. They are low rise and skinny fit styling. They have a button closure and zipper fly. They have 2 pockets in the front and 2 on the rear. They are a dark blue wash. Style #: Ultimate Fit Slim Leg. Wash : Light. Flaws (if pre-owned ): No obvious flaws to report. Pockets : Traditional 5 pocket. I worse these jeans once before I got pregnant. Worn once. These are low-rise flare jeans in a dark wash with stitched/designed back pockets and a button fly. Old Navy size 0 Regular Jeans. up for sale is this like new pair of Old Navy size 0 jeans. I will answer everything to the best of my ability. Knee : across the front of the knee. Inseam: crotch to hem. Rise : crotch to top of waist. Waist : across the waist and doubled for circumference. Leg opening: across the leg opening. Brand: Lucky Brand Size: 0 / 25 Boot cut W: Long In good condition. No stains or odors. Has 2 buttons for (zipper area) Comes from a smoke free home. No holes in pockets. 99% Cotton If you have any additional questions please feel free to message me. Thank you for visiting my store! Waist: across the waist and doubled for circumference. Sleeves: shoulder seam to sleeve hem; if no shoulder seam then from neck to sleeve hem. Rise: crotch to top of waist. Leg opening: across the leg opening. 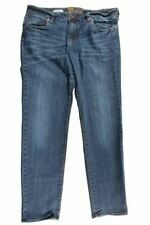 Juniors Hollister Skinny Low Rise Denim Jeans. Size 0 / W24. Material : Cotton Polyester Spandex. 10% of this sale goes to Charity Water. Charity Water is a non-profit organization bringing clean and safe water to people in developing countries. Color : Gray. Inseam 21”. Across waist 13”. NWT! "SO" LADIES SKINNY BLACK DENIM JEANS SIZE 0 $36. They are a size 0 and average length. They are low rise and skinny fit styling. They have a button closure and zipper fly. They have 2 pockets in the front and 2 on the rear. They are a black wash color. Jennifer Lopez. Cuffed, Stretch Capris. There areNO Major Flaws with this item, and is Free and Clear Of any. We are only human and may make a mistake once in a while. They have five pockets, button and zipper front closure, factory distressed. Material: Denim. Style: Straight Leg. ITEM TITLE. women's teen American Eagle AE JEGGING skinny stretch distressed jeans size 0. Condition is Pre-owned. Shipped with USPS Priority Mail. American Eagle Stretch Skinny Jeans Size 0- great condition!! These jeans are in perfect condition!! Barely worn, 100% clean, no stains, rips or holes on these! Buttons and zippers all work not broken! Medium wash pair, skinny, semi distressed on the ends. Please send only reasonable offers, it's in great/ perfect condition! See a rectangle on the back of an item?. We will work our hardest to resolve the problem for you.